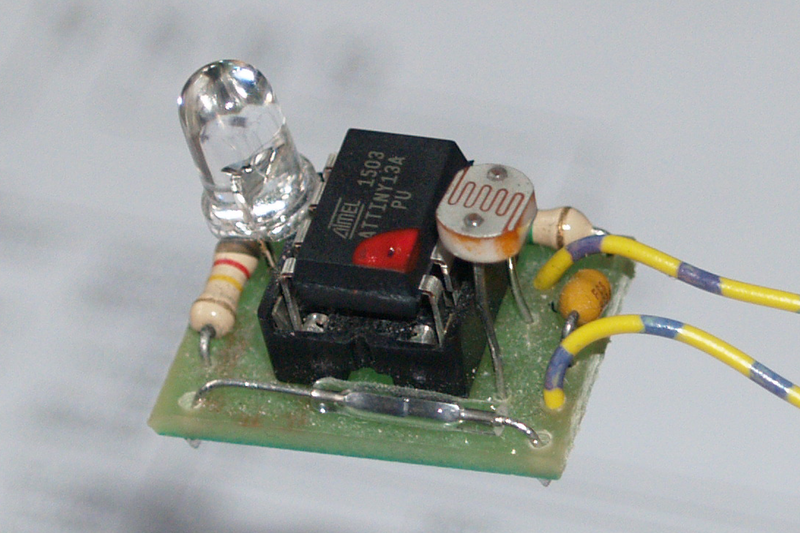 The ATtiny13A is one of the smallest microcontrollers of Atmel. Amongst others it has six digital I/Os, one analog-digital-converter and a watchdog timer. That are the functions a reactive light uses mostly. Option A means that it works with a lower supply voltage. 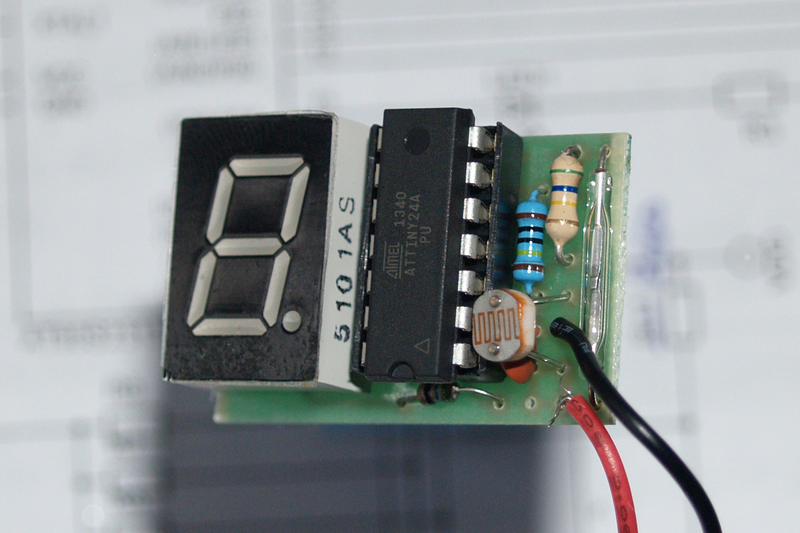 Even 1.8 V are enough for safe operation. This voltage can be delivered for a long time by two standard batteries. As the power consumption is very low, a set of batteries may last for several years. The ATtiny24A has more digital I/Os and a bigger program memory. Thereby it can control a 7 segment LED display. 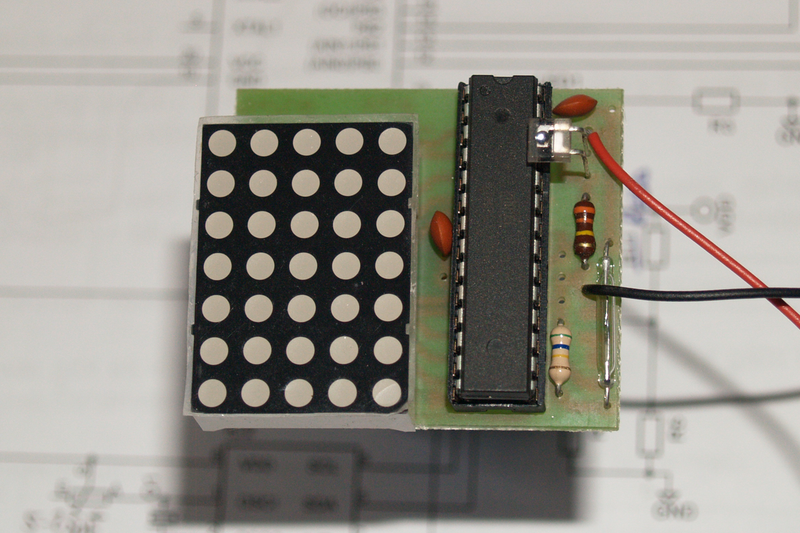 For big reactive lights with a 5x7 LED matrix display a ATmega328P is used. Is has the needed number of digital I/Os and enough program memory. There are several kinds of reactive lights. 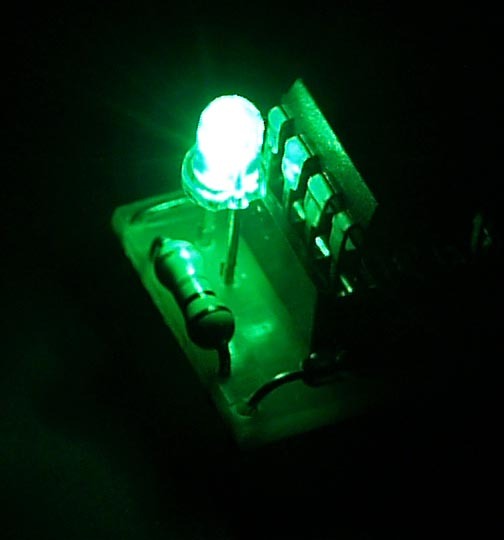 Some has just a single LED that sends a blinking sequence. Others can show a sequence of numbers and dots by using a 7 segment display. Texts can be shown by a reactive light with a 5x7 LED matrix. Beside fixed programmed blinking sequences it is also possible to change them later wothout reprogramming the controller. A variety of programs is described below. The circuit boards and kits - also with programmed and tested microcontrollers - of all here presented variations can be ordered at me. 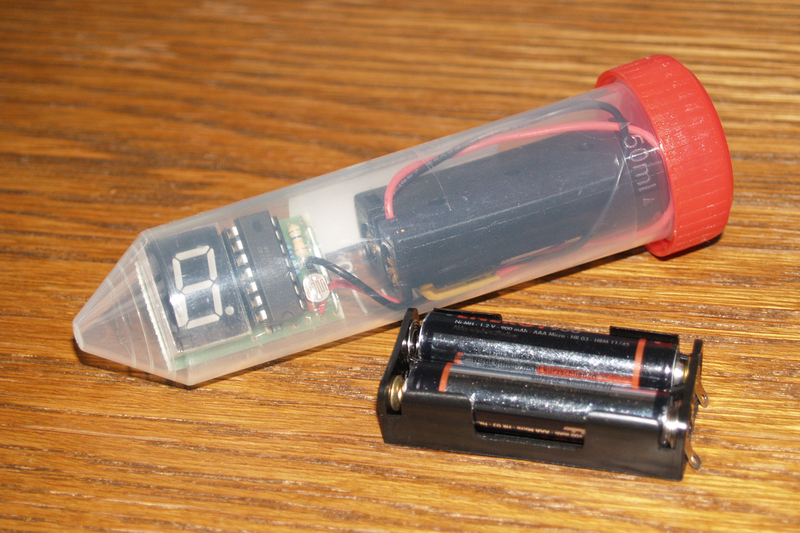 Some variations are just available as a kit with programmed controller, because the source code is non public. The kits contain all needed components and (on demand) cable. The batteries, battery holder, case and solder are not included. Battery holder and case can be ordered additionally. In contrast to many other kits that are available in the internet these kits contain sockets for the ICs to protect them from termical destruction during soldering. No SMD elements are used to make even beginners able to assemble the kits. Excluded is the reactive light with the 5x7 LED matrix. 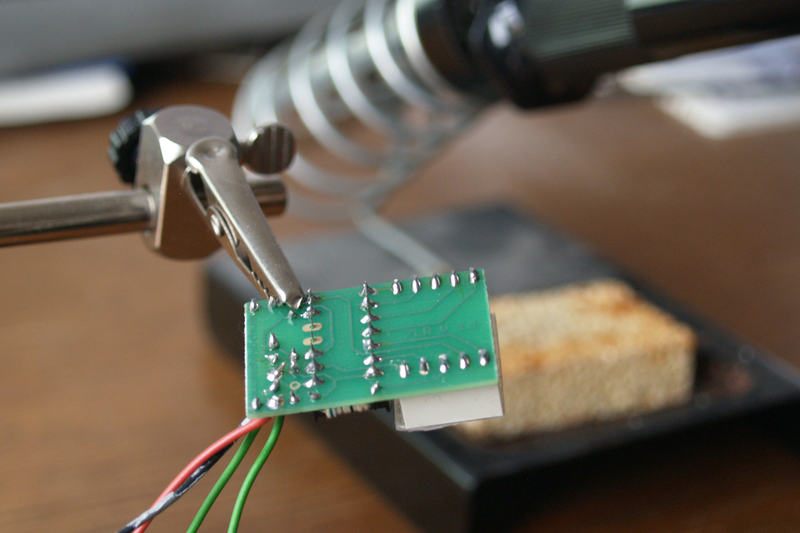 But this kit is also available with already soldered SMD elements. Anyway because of the well-thought-out design of the circuit board the reactive lights have as small dimensions as circuits with SMD elements. All prices are inclusive VAT. VAT is not shown on the invoice. Shipping and packing costs are not included in the prices. From 15 EUR ordering sum (shipping and packing costs are excluded) 5% discount is granted. Placement of orders by eMail tokontakt@reaktivlicht.de. Please add the shipping address, supply voltage (3 V or 4.5 V) and the color of the LED (at single LEDs white, yellow, red, green, blue or violet, at 7 segment displays red or green).